An appreciation of Leavis’s pedagogic practice requires us to grasp the wider conceptual framework in which he locates this. This chapter summarises Leavis’s educational world-view or Weltanschauung, drawing together a number of key ideas which Leavis developed and refined over the years. These ideas are largely derived from a critical engagement with literary texts and lead to a particular holistic conception of human creativity grounded in the nature and conditions of language and speech communities. 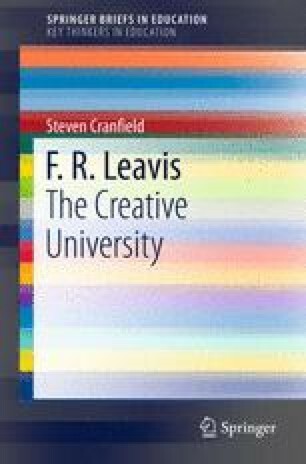 This notion of creativity is adduced by Leavis to explain his concern for a higher education under threat on many levels but chiefly from an alternative, highly instrumental and reductive notion of creativity predicated on measurable economic growth. The schematic presentation of Leavis’s ideas sets the scene for a detailed discussion of his educational practice and arguments on policy in the following chapters.